Mahayana Buddhism is sometimes called Northern Buddhism. It is mainly followed by monks and nuns, and is mainly found throughout China, Japan, Korea, Mongolia, Nepal, Russia, Tibet, and Vietnam. The original tradition within Buddhism, Theravadan, continues to flourish even today, but around the First Century BCE, a split began to develop. The Theravadans held fast to the ideas of monastic discipline, scholarly attainment, and strict adherence to the scriptures of the Buddha, while others saw this as being inflexible and difficult for anyone besides a monk to come to terms with. As a result, a movement to bring Buddhism to the "common people" began to gain popularity. This movement would eventually lead to the development of Mayahana Buddhism. The story goes that at first, the abilities of Buddha’s followers to comprehend what he had attained was limited, thus his teachings had to focus on the most important concepts of enlightenment and Nirvana. It is often said that The Buddha foresaw a time when his disciples would be ready for more than these basic teachings. This slow evolution of Buddhist thought beyond the original teachings of the Buddha demonstrated the great flexibility and openness that was possible in Buddhism, thus as it moved out of India to other countries, it was rapidly integrated into the cultures it encountered. Theravada or Hinayana Buddhism embraced the concept of the Bodhisattva, or "one who achieves perfect attainment." Theravadan Buddhists saw this as merely a guide or a model to the journey of individual enlightenment. Thus any adherent of the Theravadan Tradition who through strict discipline and devotion to scripture became enlightened had lived up to the ideal of the Bodhisattva. But Bodhisattva was seen merely as a teaching tool, only as a part of the individual’s path in reaching Nirvana. It would not reach beyond this until the formation of the Mahayana Tradition. The Mahayana determined that Bodhisattva was a mandate not for individual perfection, but to save all sentient beings from suffering. Mahayana Buddhists take a vow NOT to enter Nirvana, even though they too strive to reach enlightenment. Instead their vow is to return to the world of suffering after their death and assist all others in reaching Nirvana first, thus casting the role of Buddhists as compassionate protectors and saviors. Theravada Buddhism continued to be dominant in Southern India and Ceylon (Sri Lanka) and spread South and East through the Indo-Chinese Peninsula while Mahayana Buddhism grew and spread to the North and East. In China: Cha’an, (more popularly known by its Japanese name, Zen), and Pure Land. Both would later be transmitted to Japan. Zen migrated to Korea. Vajrayana, or Tantric Buddhism which moved North and West, finally taking root in Tibet. 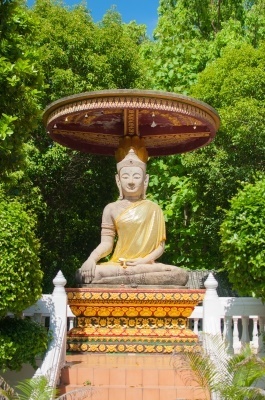 While the various sects and followers of the Buddha’s teachings may vary, the core values established by The Buddha are still shared by all Buddhists. Their methods may differ. The ultimate goal of enlightenment through patient discipline, meditation, right living, and compassion for all life is a common thread that runs deep through all Buddhist thought and tradition. It is proper to say that Mahayana Buddhism is an extension or continuation of Theravada Buddhism, because without there first being Theravada, there could be no Mahayana. Enlightenment is achieved through a normal life with varying degrees of spiritual involvement. Enlightenment is achieved through a normal life with varying degrees of spiritual involvement. Reaching Nirvana is the ultimate goal of the Theravada Buddhist. Vow to be reborn in order to help all other sentient beings reach Nirvana first. Strives for wisdom first . Compassion is the highest virtue. Centers on meditation, and requires major personal dedication such as being a monk or nun. Encourages practice in the world and among the general community. Followed as a teaching or Philosophy. Followed with reference to higher beings, more like a religion. Moved primarily South and West covering Indochina and Ceylon (Sri-Lanka). Moved Primarily North and West, covering China, Korea, Japan, and Tibet. Buddhism Today: Items of general interest to all traditions of Buddhism. Jade Buddha: a comprehensive overview of Buddhism including the origination and use of the jade mineral in Buddhist sculpture.